I received this question from a student in my online watercolor course Just Watercolor, and thought it would be a great one to share on the blog. Don’t you love this series of questions? It’s such a great example from my point of view because often times I paint without thinking about the process and questions like this really make me think! It allows me to break down my process for you so that you can understand what’s going on in my head and what actions I’m taking while I paint. I used a very sharp pointed synthetic brush (Loew-Cornell Ultraround Size 4) because these are tiny little ballerinas! About 1”-1.5” tall. I always start with the head and move down, moving a with controlled but loose strokes (remember the hand control it takes to do the “controlled shake”?) < Here I’m referencing an exercise from my online course. Don’t forget the shadow! Be very loose with this, it’s a suggested shadow. Many times my shadows were one very loose stroke! Of course I made mistakes! I still see mistakes in the ones I posted. 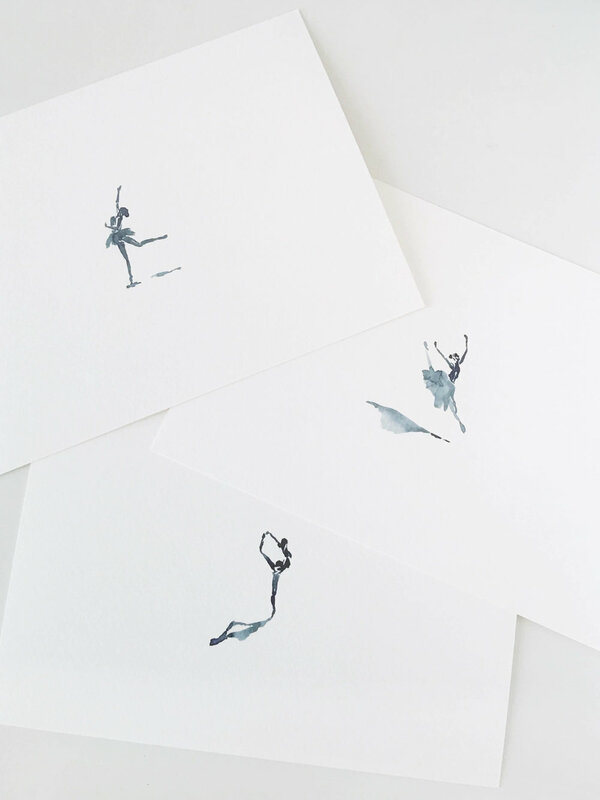 Watercolors is such a visual medium and seeing demonstrations always helps me process the method better, so I filmed a time-lapse video of 3 different ballerina paintings. I’m using a larger sized brush and painting a little bigger because it’s easier to see on camera, but the principles above and in the video apply to a smaller scale too. Personally, I like how the tiny ballerinas look better than these larger ones in the video. For reference, they are about double the size of the ones I painted and use in my art prints. As a final note to this blog post I do want to point out that YES, I made mistakes while filming these! Sometimes hands ended up looking like gloves, arms had no wrists, it all ended up looking weird and I started over. No one is perfect and everything takes practice! If you try this out and post it to Instagram, don’t forget to tag me @raeandlily so I can see! Finally, if you liked this post and video, I’d love for you to share, subscribe, or let me know in the comments below!